for information on this smaller chain. and the Tamiya ladder chain with 10 mm diameter magnets attached to a link. Just another 2 chain drive options that are known to work. I'm guessing that the large Tamiya chain is made of Delrin(TM). How did you fix the magnets to it ? ... except maybe some small Grandt-Line parts, years ago. Bob ... The monorails look AWESOME ! The smaller Servo-Link chain is acetyl and the larger Tamiya chain is Delrin or similar. So far the best results have been obtained with 2 part super-glues. These have a primer and the glue. The bond is brittle and any sharp sideways impact will shear the bond. In a straight pull situation the bond appears to be OK. The results obtained with solvent type glues for styrene were disappointing. The 2 contact adhesives we tried were unsuccessful. ensure that you de-point your sprockets so that you don't push off the bit that you have glued to the chain. We learned this one the hard way. I have sold about 12 belt drive chassis and complete conversions in the past year, all of these are 2 stage reduction. They run at a high speed (about 1 foot per second) and while low speed operation is OK it is probably not good enough for a train. I originally looked at 3 stage reduction but shelved it due to complexity. Well, now after a year of designs it does not look that difficult so I un-shelved it and am about to order 3D prints to make it work. I know there is a long way from drawings to a working train so this is probably not the final version but it looks good. Final drive is dual belts for improved power capacity. My typical motor is a R.C. car motor so that would be replaced with something milder. 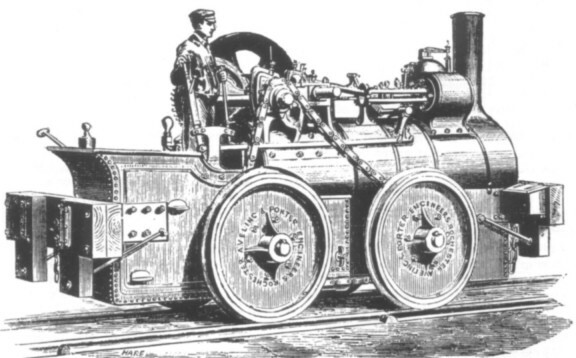 Used on some New Zealand 'Bush Tramway' locomotives. Devised by George Davidson and patented. The chain was so made that all loadings were not carried on the pivot pins, but by shoulders machined into the links. In the original chain, sprocket wheels used were of the flat or single disc type with teeth at every link (i.e. on a pitch of 4). 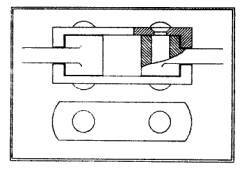 It was necessary to adapt the chain for use on the bush lokeys so that misalignment could be accepted. and the teeth protruding from the bottom of the groove into every second link (i.e. on a pitch of 8). It has a roller-pitch slightly larger than the 0.1227" pitch 'Delrin'(TM) type already mentioned. The sizes are really quite similar, but in fact this ^^ one is a tad bigger. It is precision made, out of stainless-steel & is FANTASTICALLY expensive ! You can find it on the Net, by searching for it's pitch, of 0.1475"
... for large-scale professional R.C. racing motorcycles. 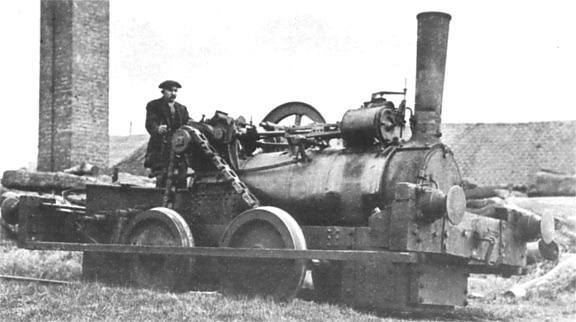 It might be of interest to someone with a large-scale loco, who needs TOUGH ! ... needn't worry 'too much' about it by the looks of things ! so a 3" or even 4" wide for a truck doesn't seem to be out of scale to me. Looks like an US V8 style timing chain. I used a pair of miniature plastic drive chains to power and animate the boom of a remotely controlled Lionel 6-29839 O-Gauge Cherry Picker.